Some things take a little explaining… even when you may think they don’t. The above picture, for instance. 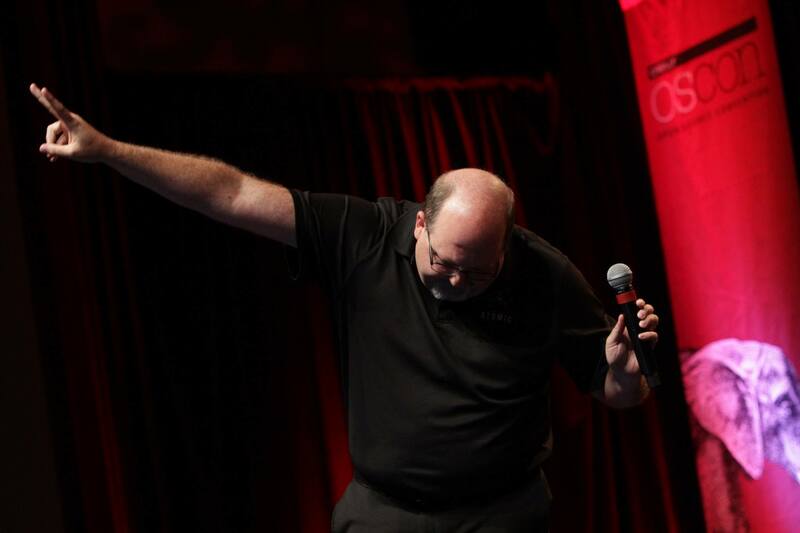 Taken at OSCON 2014 at the end of of a lightning talk, it seems to pretty well sum up the tomfoolery that many of my friends and colleagues have come to expect when I am on a stage. There is a long history of this, mind you, all the way back to middle school musicals and winding its way through choir concerts, high school cabaret shows, and through college. If there’s a chance to act like a doof in front of an audience, most people who know me will tell you, Brian will surely take it. And a middle-aged Midwestern dude throwing gang signs at the end of a technical talk is par for the course. And I am hardly one to dispute that. I’m a ham, pure and simple. While there is no denying the showing off, the gesture itself carries a lot more meaning than simple showmanship. Because I am actually flashing the sign of peace, which for me is a very important message indeed. Peace is a word that (I hope) people in my world associate with me as well. It’s a quiet word, often quietly mentioned when I depart, or as a sign-off in a letter or e-mail message. I started using “Peace” as a closing for messages a long time ago, borrowed from a high school friend who did the same thing. Initially, it was a convenience: “Peace” sounds a lot less stuffy than “Sincerely”, and certainly not as emotionally loaded as “Yours” or “Yours Truly.” And, as a closing, it was socially acceptable to use with anyone, family, friends, or otherwise. “Love,” which I do use with family, is very specific in its use. There are friends that I assuredly love, but this is not something that I will bandy about casually. “Peace,” therefore, is a perfectly acceptable closing to use for nearly any situation. The gesture itself I have used for as long as I can remember (though usually just a less excited holding up of two fingers). “Peace,” my Mom or I would say to the other, followed immediately by holding up three fingers and saying “three.” “Three” was for “I love you,” and the alternating two- and three fingered gesture would be maintained well into my childhood, until we learned the American Sign Language sign for “I love you,” and the old sign of affection was replaced by the new one. I’ve been thinking a lot more about peace lately, as I watch the world around us and also live within a family of very strong-minded and intelligent women. Peace seems something that can be very hard to come by, and I am always reminded that peace is not something we can take for granted in this world of smart phones and 24-hour news cycles. If anything, it’s something we have to work for even more. It’s too easy to be removed from a situation and think, well, that’s their problem, not mine. Or, something like that would never happen here. But when people disassociate themselves too much from events near and far, when they can escape so easily into the things with which they’ve surrounded themselves, then not only do they close their eyes to the problem, they also begin to shield themselves from the solutions. Peace is not easy. We live in an entropic universe with a scarcity-based economy…. a big recipe for trouble right there. But nothing worth doing is ever easy. So with sincerity and the promise of a new year to come, may you find peace. I’ll certainly be reminding you.